NOTICE: Make sure you have downloaded and installed the new Tacview 1.7.2 package from 2018-09-05 which fixes the 3D models randomly displayed as cubes as well as network connectivity issues. This release is a big step forward more customization: I have integrated Lua 5.3.4 in Tacview and started to develop an easy to use API. Now, anyone with some programing skills can create addons to extend existing features and even add new features to Tacview! 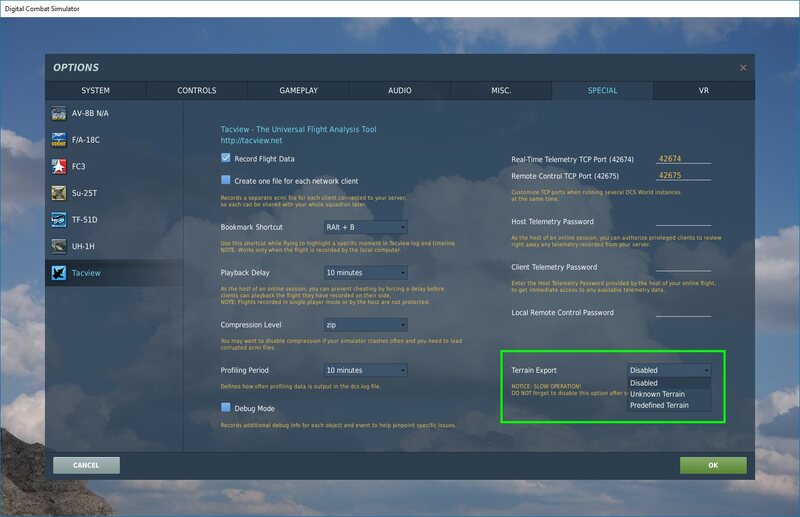 How to create your own addon? • Now you can use any of the features documented in C:\Program Files (x86)\Tacview\AddOns\Tacview Lua * Interface.txt to create your own addon! Keep in mind that this is a first iteration. While the current API is still relatively limited, new features will be added over the coming releases. Just let me know whatever you need. I will do my best to add more Lua functions, so everyone can develop the addon of your dream. The most notable example is the Landing Signal Officer (currently in development) which (will) displays an LSO view when you select an aircraft carrier as switch to cockpit view. This addon will soon automatically score landing attempts. A new option has been added to DCS World option page: Terrain Export. It is a long operation: It will look like DCS is frozen at the end of the mission load. This is normal, just wait for 1 to 10 minutes (depending on your system) for the terrain to be exported. As soon as you are in the mission, return to the main menu and disable the terrain export feature (to not wait 10 minutes the next time you launch a mission!). Now, the next time you will launch Tacview, it will display the terrain tiles you have just created! This very feature was used to integrate the Persian map in Tacview and to update the other maps with the latest version of DCS World. Some airports may not be visible, this is normal, they are not part of the terrain, they will be manually added in future updates of Tacview. Thanks to the work of Lefuneste, you can now display IL-2 maps in Tacview! Then relaunch Tacview and make sure custom textures and either automatic or IL-2 terrain is selected. Again, many thanks to Lefuneste for his excellent work! My current plan is to continue to update Tacview 1.x and to use it as a test bed for the new features which will be available in Tacview 2.x. Indeed, I have started to work part-time on Tacview 2, working first on all the necessary tools to develop it. The goal is to offer you an even more intuitive, fresh and modern UI, a smoother experience on low-end systems, and easier and more customization possibilities, on all platforms: Windows, Linux, macOS, iOS, and Android. 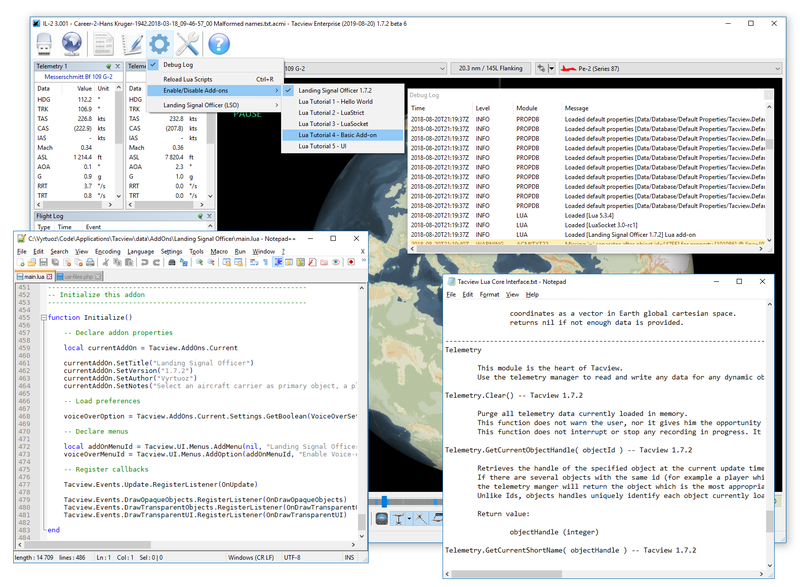 Re: Tacview 1.7.2 and it's Lua SDK are available now! Thanks to your feedback, I was able to pinpoint and fix a random bug which was displaying cubes instead of the proper 3D models. This regression has been introduced in Tacview 1.7.0. Until now it occurred rarely, but it looks like it was more frequent in Tacview 1.7.2. Thanks to your feedback, I was able to pinpoint and fix a random bug which was displaying cubes instead of the proper 3D models. 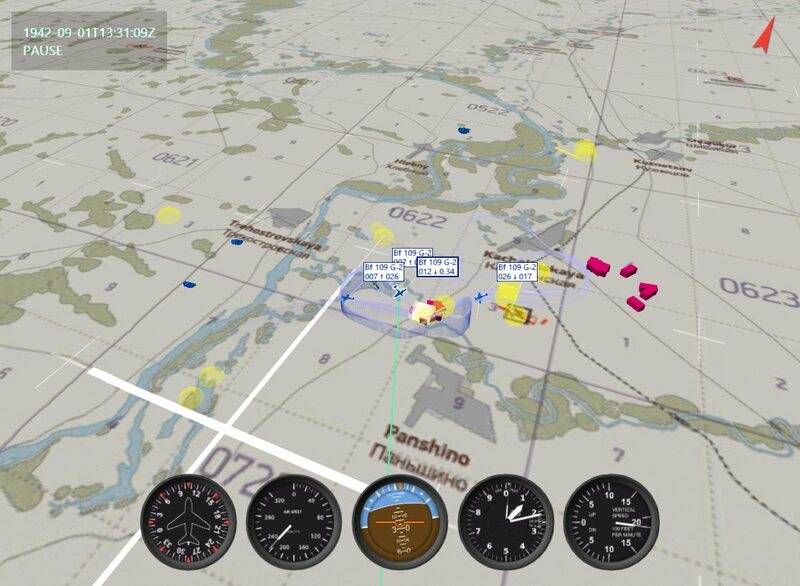 The initial release of Tacview 1.7.2 was not able to establish a connection to a remote computer (real-time telemetry, online debriefing, and remote controls). It was because of a very subtle regression in Tacview net code. Thanks to your feedback and the help of the community, I was able to narrow down and fix the issue. Now you can enjoy anew online debriefings in a comfortable environment!